I made some progress the rest of the frame beyond the cabinet and it’s coming along a bit faster than the cabinet. 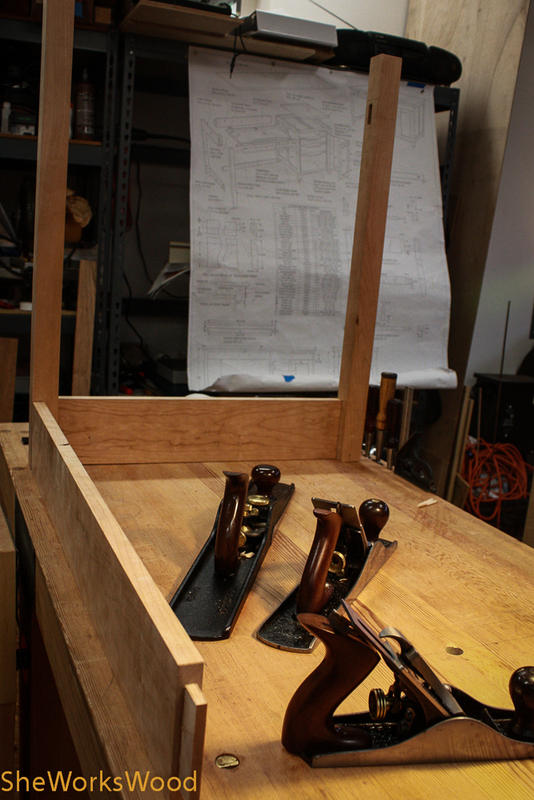 I’m certainly getting a lot of practice making and fitting tenons. This entry was posted in desk, mortise, mortising platform, tenon and tagged desk. Bookmark the permalink. 8 Responses to More progress on the desk. It’s coming along very well, Marilyn! Can’t wait to see this done, have you thought about the finish? You and me both. I have two clocks I’m dying to get to, but I’m not starting them until this is done. I’ll probably use the same finish I used on my tool cabinet – Pro Fin (Daly’s). Its held up well on that cabinet and the cherry on that cabinet has mellowed to a really nice color. I think that’s a varnish finish according to the recent Flexner column in Popular Woodworking. I’m experimenting with finishes. I really like how the finish came out on my shaker stool and tool chest (shellac), and am going to try something slightly different with the 3-legged stool I’m working on. Did you go to Glen Huey’s “Finishes that Pop” talk at WIA? I have the DVD if you want to watch it. I might put shellac under the daly’s to prevent blotching. Yippee! I finished them up tonight. Thanks!